Teacher Carts make it easy to give yourself a hand while teaching. Teaching Easels, Utility Carts for teachers, Art Storage Carts, and Book Carts make storing and moving materials smooth sailing. Sharing a classroom can make it tough to keep track of supplies and give a personal touch to a room. 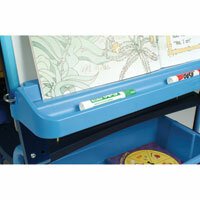 Teaching Easels with drawers make it easy to bring all of your supplies along with you from room to room. Teacher Carts with tub drawers to store Preschool Toys and Supplies in make keeping track of everything easy. Other Teacher Cart Accessories, like adhesive name labels, keep you organized, so you can spend more time teaching and less time frantically searching for a dry erase marker. Set the students up with a Walkodile and you could easily bring the class outdoors for some reading and teaching on nice days. It�s easy to go from room to room or inside to outside if that�s what you�re looking for. 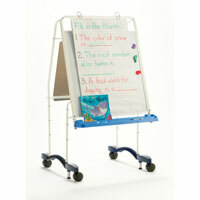 Teaching easels on wheels and a library on wheels keep your hands free and your supplies secure.